This week’s pair of Celeb BFFs first met as cast mates on the children’s television show Barney and have now ventured off into having their very own television shows/movies on the Disney Channel. 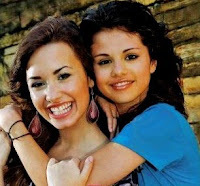 The 2 lovely ladies that we’re talking about are none other than: Selena Gomez & Demi Lovato. These 2 gals are genuine examples of BFFs. They value their friendship so much that they put it above and beyond EVERYTHING. In a recent interview with People Magazine, The 16 year-old best friends made sure to note that they’d definitely sacrifice boys for friendship, “I’m very protective of our friendship. I think I’d be like, ‘You can have him, because I don’t want to ruin our friendship.’ Then she’d be like, ‘No, you can have him,’ and then we’d end up not liking him” says Demi. Boys usually can impair or break a friendship and that right there shows how much love these BFFS have for one another.